As an ancient Chinese practice, tai chi may seem foreign and even intimidating. Perhaps your only experience with tai chi is watching video clips or seeing photos of large groups of Chinese people doing tai chi in parks—a rare occurrence in the United States. Only about 1% of the U.S. population, or about 3.65 million Americans, reported doing tai chi in 2015. That means a lot of Americans are missing out on myriad benefits that tai chi has to offer. The goal of this report is to make tai chi more familiar, more accessible, and easy to practice regularly—even right in your living room. For roughly two decades, I’ve been working to bridge the gap between the practice and the science of tai chi and to integrate it into Western health care. By day, I am a medical researcher at Harvard Medical School, and by night, I am a community-based tai chi instructor. My interest in tai chi grew out of a passion for sports and martial arts that started when I was in high school. It was during that time that I also became interested in science, which led me to study human ecology and get a Ph.D. in evolutionary biology from Harvard University. But it wasn’t until a trip to China in 2000 that my two worlds came together, and I made a major career shift, ultimately resulting in my current position as research director for the Osher Center for Integrative Medicine, which is jointly based at Harvard Medical School and Brigham and Women’s Hospital. In my role as a scientist, I focus on objective, rigorous scientific research to understand what works, what doesn’t work, what is safe, and what offers promise to help people. Yet while I use research and science to inform my personal tai chi practice and the classes I teach, I must suspend pure rational thinking at times in order to get the most out of my practice. Tai chi and other meditative arts include tapping into intuition and imagination, processes less understood by science. 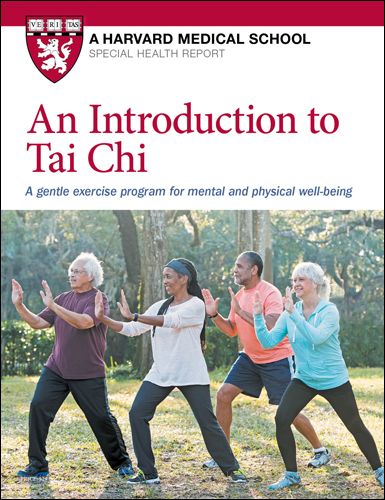 In this report, I’ve brought these two worlds together to introduce you to tai chi and give you a program so you can begin practicing this gentle, mind-body exercise today. How does tai chi fit into your overall exercise plan? One of the best ways to learn how to do tai chi is to observe it and follow along. That’s why we created videos of both the Standing Tai Chi Calisthenics and the Tai Chi Elements. Reviewing the videos before trying the moves on the following pages will make learning tai chi easier. You can find these videos online at www.health.harvard.edu/tai-chi-calisthenics and www.health.harvard.edu/tai-chi-elements. In addition, the tips below will help you to get more benefits out of your practice and reduce your risk of injury. Enjoy it. Enjoy the movements and breathing. Don’t worry about whether you are doing everything right. Don’t think too much about doing it perfectly—just do. Enjoyment will deepen your practice and help your qi to flow more freely. Worrying or overthinking it disrupts the flow and pulls you out of the moment. Get grounded. Feel the ground with your feet. Release your weight into the ground and maintain good body alignment to promote stability and balance. Take it slow. Moving slowly gives you time to sense your body’s position, uncover hidden tensions, and make postural modifications so that different parts of your body move more harmoniously together. Obey the 70% rule. A key principle of tai chi is moderation in effort, which may contribute to its low risk of injury. This principle is referred to as the 70% rule. Basically, it means to avoid extremes, in which injuries are more likely to occur. Instead, stay at about 70% of your effort, intensity, or range of motion. Never force a movement beyond about 70%. For example, keep a slight bend in your elbow when you extend your arm instead of fully extending it and locking your elbow. Similarly, when stretching your back, for example, stop well before you sense fear of straining muscles or causing a spasm. If you feel any pain or resistance to a move, back off from it. Be mindful. As you move from side to side, do so in a mindful way. Can you feel the contact between your feet and the ground? Can you feel how your feet connect to the rest of your body? Can you feel your body slowly relaxing as you breathe? Can you do all that without clenching your neck and jaw? You may not be able to do any of the above well, but just being aware of these things is a critical first step. As soon as you start moving, the movement should serve as the “magnet” for your attention. Let it draw your awareness to the parts that are moving. Move from your center. Imagine your head, torso, and pelvis as a single column aligned over your legs and feet. All upper and lower body movements are integrated with the movement of this “column,” which includes the body’s center of gravity. Do not twist the spine. The tai chi classics say that good movements begin beneath your feet, are steered by the waist, and applied through the arms. Be aware of your “inner ocean.” Your body is roughly 60% liquid. With this in mind, think of moving an inner ocean when you perform tai chi, rather than changing the shape or position of a solid object. Keep the movements smooth and flowing, as if you were in a pool—the kind of movements that would create gentle waves instead of splashes. Do some, not none. As with learning to play an instrument, the more time you put into tai chi, the more you’ll get out of it. Whether you have time for only a few 30-minute sessions a week, or 10 minutes a day, do it! You’ll still get benefits. But if you want to overcome a serious health problem or develop a deeper spiritual practice, a more rigorous regimen, such as longer 30- to 60-minute daily sessions, will help you to achieve those goals. Pace yourself. Just like a young tree thrives when it receives intermittent rain instead of a single downpour, you’ll see more benefits by doing a little tai chi more frequently than doing a lot in isolated sessions that are few and far between. This is especially important when you are beginning a practice. Start with just 10 or 15 minutes and then gradually increase. Even five minutes most days of the week is better than doing nothing at all. your progress. Celebrate these improvements.